In Agitated Swirl Flash Dryers, the wet feed is fed into the dryer housing by suitable feeding mechanism above the rotating swirl agitator. The hot air / gas stream is also admitted in the drying duct through specially designed distributor, admitting the air in swirling fashion. The material remains in agitated bed & dried material gets carried forward & separated in the Cyclones or bag filters. Some applications require pre-conditioning of feed by back-mixing of dry product. AVM offers Customized Agitated Swirl Flash Drying Systems with variety of Configurations. Specially design double shaft feeder followed by mono screw. Positive Displacement Screw Pump for Viscous liquid / Pastes. Indirect Air Heaters: Using Steam / Hot Oil / Thermic Fluid. Electric Air Heaters: using electricity. Cyclone Separators – Mono, Twin, Quadruple, Multi etc. 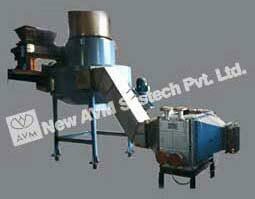 Wet Scrubbers – Direct Contact Ventury, Adjustable Ventury, Packed scrubbers etc. Product Cooling and Conveying Systems. Exhaust gases Recycling for better thermal efficiencies. Safety accessories like Static Jumpers, Fire Fighting Systems, Rupture Disc etc. Water Cooled Dryer Agitator bearing housing for high temp. operation.